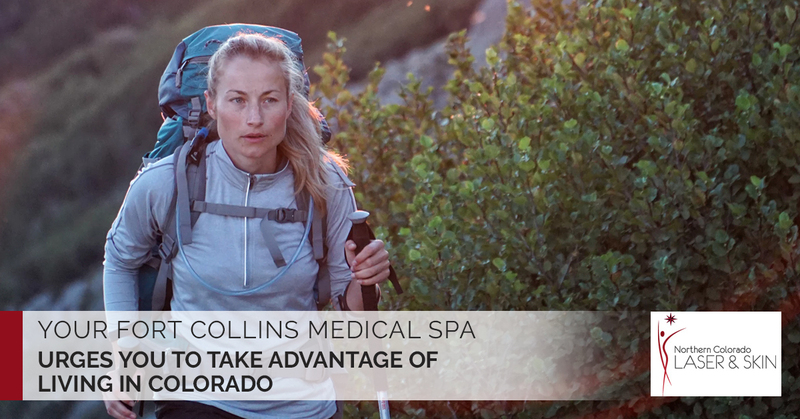 Whether you live in Greeley or Fort Collins, it doesn’t really matter, both cities are located in beautiful Northern Colorado and both have Northern Colorado Laser and Skin Medical Spa locations. It’s almost like being in heaven. You rely on Northern Colorado Laser and Skin to keep you looking good with their spa services and aesthetic services. But this is only a part of the whole picture. In addition to looking good, you want to feel amazing as well. This means you need to eat right and get plenty of exercise. And since you live in Northern Colorado, you can get plenty of exercise doing the outdoor activities you love so much. Sure, Colorado offers great healthy activities like hiking and skiing, but it doesn’t stop there. Here is a small list of outdoor activities that you can do to stay healthy and have a whole lot of fun at the same time. Whitewater rafting is one of the don’t-miss activities Colorado has to offer. Not only is white water rafting a thrilling experience and a fun way to spend the day, it offers a number of health benefits as well. Rafting is a whole lot more than just sitting in a raft. You will need to be paddling much of the time and you will be using muscles you didn’t know you had to stay balanced. In fact, you could burn as many as 350 calories for every hour you spend rafting. While it might not seem like it as you accelerate down the raging river, rafting is actually a really good way to help you de-stress. Hey, anything is better than being stuck in an office building all day. If you have a fear of heights, there is no better way to overcome your trepidation than by going rock climbing. Whether you choose to conquer a boulder in the foothills or go all out and dangle off the side of a 12,000-foot cliff, rock climbing is sure to be an adventure with plenty of benefits. Rock climbing is a great way to work out your core muscles, and all your other muscles for that matter. When you go rock climbing, you will be using almost all of the muscles you have at least to some extent. And when you reach the top of that boulder or mountain, you will be overcome with a sense of pride and happiness at your accomplishment. It’s a good feeling that will stay with you for quite some time. Moab might be long known for its bike-able trails, but Colorado has plenty of places you can take your mountain bike for a day of fun. Never underestimate the power of nature when it comes to changing your mood and your general health. The physical benefits of mountain biking are obvious; you spend the day pedaling up and down mountain trails working a variety of muscles and burning calories. But you are also riding your bike in some of the most beautiful, scenic spots in the country, which reduces your blood pressure and increases your well-being. If anybody has told you that fishing in Colorado can’t be considered exercise, then it is obvious that they have never fished in Colorado. Colorado is home to over 2,000 natural lakes and over 9,000 miles of rivers and other waterways filled with a variety of trout. And if you think Colorado fishing is as easy as driving to your favorite fishing hole and snoozing while waiting for a bite, then you don’t know how to properly fish. Fishing in Colorado is all about finding the best spots, which just happen to be off the beaten trails. This means you need to hike to get to the hot fishing zones. In addition, both fly fishing and casting all day is a great workout. Let’s not forget about hiking as it is a most excellent way to get some exercise and enjoy the beauty our state has to offer. A day out on a mountain trail will burn a lot of calories, workout many muscles and leave you relaxed and ready for a good night’s sleep. Let the glorious outdoor activities you can do in Colorado keep you healthy. Let Northern Colorado Skin and Laser keep you beautiful. Call now.